My internship is pretty great. It’s exactly the type of journalism job I’ve always wanted, it’s paid, a little, which in journalism is saying a lot and everyone in the office has been welcoming and friendly to the new intern. One co-worker and I even bonded over our love of nut butters for at least five minutes on the first day. However, working does not allow me much free time. It’s a mystery to me how the masses of regular working people handle 9 am-5 pm jobs every day. My summers in the past have been marked by copious amounts of free time that I’ve used to my advantage… mostly to cook for fun. Obviously, this summer called for some rethinking in order to fit healthy food into a busy schedule. The solution for a fast, tasty and healthy breakfast came to me in the form of an old favorite: overnight oatmeal. Right now, I’m into creating different variations of oatmeal to keep it interesting. Here’s the guide to the perfect breakfast for the intern on-the-go that only requires a little planning the night before. No matter how much you want to save time, though, no one likes plain oats. Here’s where the fun comes in—there are endless variations to overnight oats and experimenting never gets old. Check out these fun flavor combos to get you started. 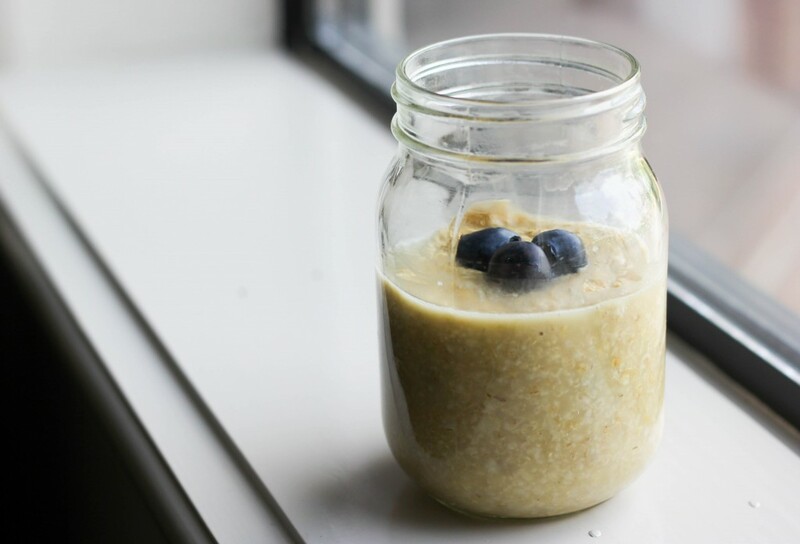 Layer your oats in a Mason jar with a mixture of Greek yogurt and fruit. My personal favorite is vanilla yogurt and blueberries mixed together. The oats soak up some of the yogurt overnight, leaving you with a unique consistency and taste in the morning. Adding some vanilla extract to your oats as they cook makes this particular flavor combination even stronger. Yeah, you heard me, and it’s much better than your average sandwich. Alternate layers of creamy peanut butter, oats and jelly to add a more savory taste to your typical oatmeal. Are you the morning workout type, or do you just prefer a heartier breakfast? Stir in ¼ cup liquid egg whites as your oats cook. This will make the oatmeal fluffier (and full of protein) without changing the taste. If you really want a protein-packed breakfast, add a scoop of flavored whey protein powder (my favorite is cinnamon swirl whey) before you store the oats in a Mason jar. Oatmeal is pretty healthy on it’s own, but this variation provides some extra protein and healthy fats. Add a swirl of nut butter (almond, cashew, peanut—your pick!) to your oatmeal after you’ve removed it from the heat. The nut butter will melt into the oatmeal, giving it a great taste. Once you place the oats in a Mason jar, add some crushed nuts on top for extra crunch. A personal favorite, this one caters to your sweet tooth, without adding too much sugar or fat. Add 2 tablespoons cocoa powder to your oats as they cool, making sure to stir well, and layer your jar of oats with sprinkles of chocolate chips. And there you have it: overnight oatmeal to eat the next day at your desk, in the car, on the subway…or just in your kitchen.